MALAYBALAY CITY (IPS) The College of Business (COB) is leading so far in the sports competitions of the BukSU Intramurals 2018 with 349.5 points, according to the tally from the Office of the Sports Coordinator as of September 21, Friday, 3:50p.m. 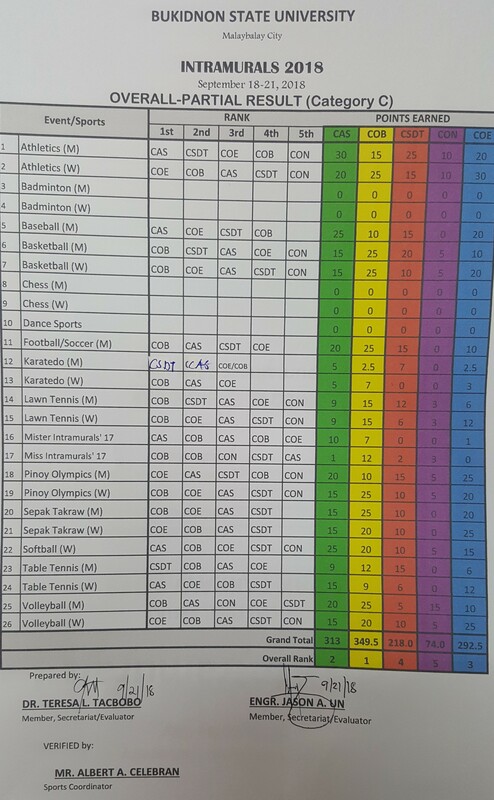 So far, the tally already included results of 21 of the 26 events included in the point system for the sports competitions. Only the results from Badminton men and women, Chess men and women and dance sports were not yet computed as the events are still on going, Mr. Albert Celebran, sports coordinator told IPS. The COBʾs Dragons won the gold in 10 out of the 26 events included in the sports competition point system. The Dragons lorded over in both men and women categories for Basketball and Lawn Tennis. They also won the gold in Soccer Men, Karatedo Women, Pinoy Olympics Women, Sepak Takraw Men, Volleyball Men and Miss BukSU 2018. The College of Arts and Sciences’ Stallions is closing in at second so far with 313 points and followed by the College of Educationʾs Eagles for third with 292.5 points. The College of Social Development and Technology Tigers ranked fourth so far with 218 points and the College of Nursing Blazing Phoenix with 74 points for the fifth place. The Stallions won the gold in five events: Athletics men, Baseball (played for men in the tournament), Softball (played for women), table tennis women and Mr. BukSU 2018. The Eagles won the gold in Athletics women, Pinoy Olympics men, Sepak Takraw women, and Volleyball women. The Tigers won the gold in Karatedo men and table tennis men. The organizers have already started awarding the medals to the winners at the BukSU Gymnasium around 4p.m. Friday, the fourth and last day of the BukSU Intramurals 2018. Meanwhile, the College of Education bagged the highest points in the Intramurals 2018 Culture and the Arts Festival, according to the results released by Dr. Regina B. Dumdumaya, Culture and the Arts Coordinator of the Intramurals 2018 (see related story).